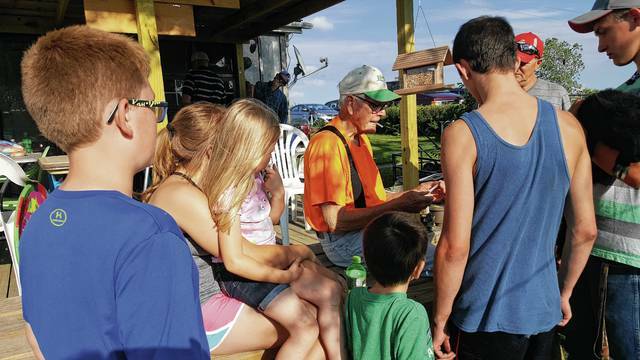 On May 29, Roger Rutan Sr. hosted the For the Love of Everything 4-H Club. Pledges were led by Ben Rogers and Carter Titus. Then the group participated in demonstrations and informational talks about animal care on a small farm. The group learned about the importance of trimming goat hooves and docking sheep tails. Some members assisted with animal shots. We learned animals need immunizations, too. 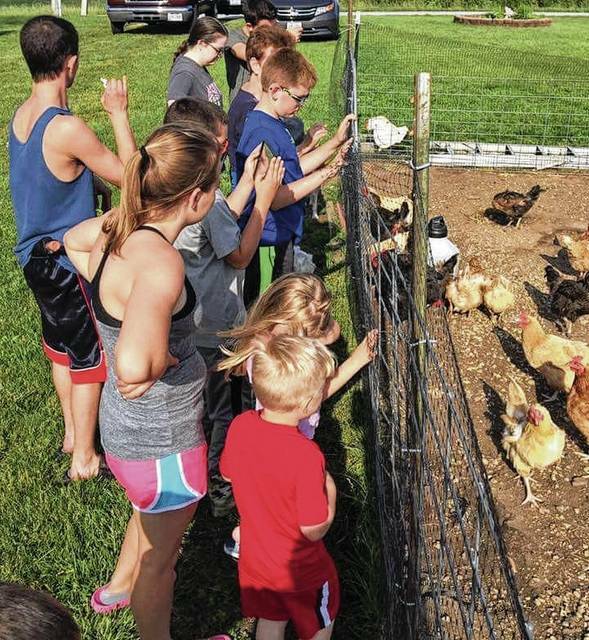 For the Love of Everything members fed chickens and ducks on Roger Rutan Sr.’s farm May 29 and learned almost no food needs to be wasted or thrown away on a small farm. Club members enjoyed a wiener roast and potluck with family members and ended the evening with a game involving a really big Frisbee. The club expressed appreciation for Mr. Rutan’s many lessons. The Backyard Belles and Boys 4-H Club held its fifth meeting on Sunday, May 21, at the home of Oliver, Avery and Essie McGuire. The meeting was called to order by president, Oliver McGuire. Sarah Lewis led the Pledge of Allegiance, and Paige Chesser led the 4-H Pledge. Attendance was taken, and the news report was shared. Makenna Parker gave the treasurer’s report and it was approved. In old business, Grady Underwood made a motion for the club to go canoeing on July 15, 2017 at 12:00 PM and Zoey Underwood seconded it. In new business, Sarah Lewis made a motion for the club to participate in button day at Steve’s Market on Saturday, June 3, 2017 from 9:00 AM – 12:00 PM. Essie McGuire presented a safety report on how to “Pool Safely.” All members present then took the Pool Safely Pledge and received a sticker and a beach ball for doing so. Zoey Underwood motioned to adjourn the meeting, and Paige Chesser seconded it. Our next meeting will be held on Sunday, June21, 2017 at 12:00 PM at the home of Zoey and Grady Underwood. Terre Haute Raisers talked about many things. We got our club shirts today! At showmanship, dress as if you are the judge. You will have to practice checking your rabbits or cavies’ eyes, teeth, nails, gender, fur, crown, ears, tail, body type, nose, check eyes twice because its easy to miss sleepy eye. At showmanship you have to practice showing like you’re a judge. Shake the Judges hand, be nice and smile. If you don’t know how to answer a question on the showmanship test, you just say I don’t know. Make sure you work with your animal so you can flip them over and if they don’t want to flip over, keep trying. You should also know what kind of food you feed your animal. We will be setting up work sessions in June and some in July, They will be about handling and all the other skillathon categories. We talked about all of the common disease in rabbits: #1: Overgrown teeth: This is caused by rabbits not eating enough fiber, so they aren’t grinding their teeth since their teeth never stop growing; #2: The Sniffles: Causes infected bad sneezes that causes bacteria that spreads through the air. It effects the rabbit by having discharge and redness and squinting; #3: hairballs: Since rabbits self-groom themselves, the hair often ends up in the stomach. It travels through the gut and if it causes a blockage it will lead to some complications. The treatment is surgery, there are some medications to get the gut working again; #4: Urine Tumors: it causes cancer. It should be suspected that if an unsexed female rabbit becomes sick, the treatment is desexing prior to cancer spreading to the body. https://www.urbanacitizen.com/wp-content/uploads/sites/36/2017/06/web1_20170528_182749.jpgOn May 29, Roger Rutan Sr. hosted the For the Love of Everything 4-H Club. Pledges were led by Ben Rogers and Carter Titus. Then the group participated in demonstrations and informational talks about animal care on a small farm. The group learned about the importance of trimming goat hooves and docking sheep tails. Some members assisted with animal shots. We learned animals need immunizations, too. https://www.urbanacitizen.com/wp-content/uploads/sites/36/2017/06/web1_FB_IMG_1496021586127.jpgFor the Love of Everything members fed chickens and ducks on Roger Rutan Sr.’s farm May 29 and learned almost no food needs to be wasted or thrown away on a small farm. Club members enjoyed a wiener roast and potluck with family members and ended the evening with a game involving a really big Frisbee. The club expressed appreciation for Mr. Rutan’s many lessons.